Momos have now become the quintessential Tibetan dish that everyone talks about and loves but traditionally, in Tibet, momos were considered more of a family meal – something to be made together and eaten in the family kitchen. One of my favorite videos about mo-mo making (of which there are quite a few online), is this one by a young Tibetan-American from Boise, Idaho who filmed his father making momos. The video is titled “Momos! – My Father’s Way” and I share it here. Like the Dad says in this video, cooking for most of us Tibetans translates to “use common sense” – “no recipes” – “no nothing” J but sometimes it’s helpful to have a recipe, so below is my ingredient list and recipe for the basic Sha momo. 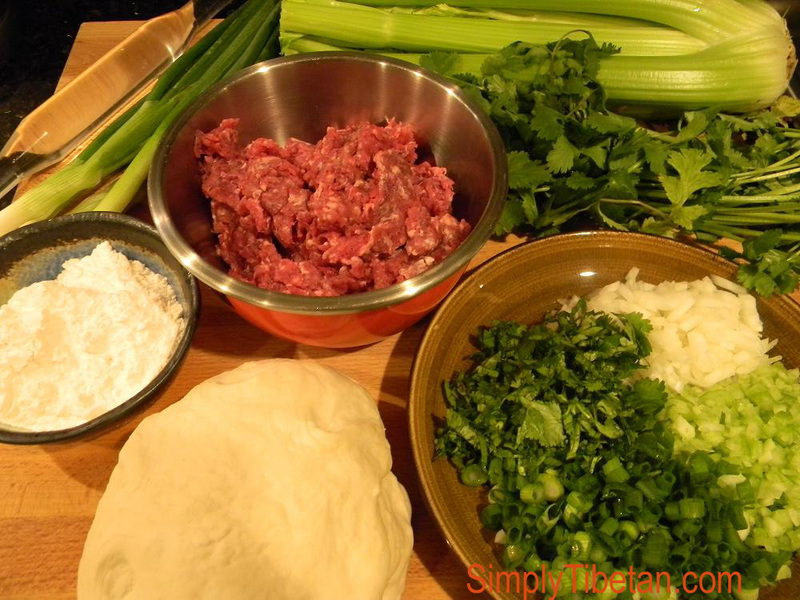 When making momos there are three main things to keep in mind. First the dough, then the filling, and then the last step is the steaming. Of course, making the momo skin and shaping the momo is also a skill that needs some practice. As little kids, we would all be given a piece of dough and we would practice shaping momos again and again in the kitchen. This actually is a great way to keep the kids occupied with a piece of dough while the adults actually make the real momos. Momos come in many different shapes, cooking styles and of course everyone has their own version of the inside filling. 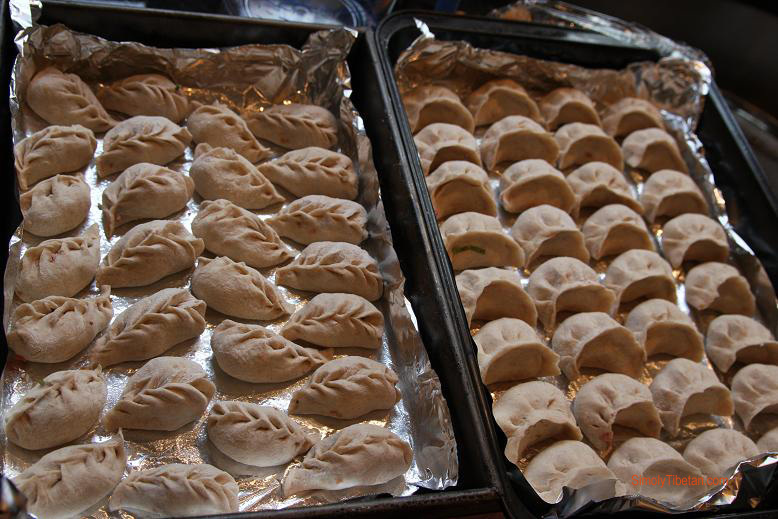 Here I choose to share how we make the basic steamed sha-momo in our home. With momos, we like to have a side of Labu Dangtsel and homemade hot tomato salsa. In a large bowl, add the meat, chopped veggies and rest of ingredients and mix it thoroughly. Best to use your hands and dig into the bowl and gently mix it all up really well. Adding some water, and the celery and greens will add to making juicy momos. * I find that Chinese celery adds the best flavor but regular celery is fine too. If I don’t have celery, then I substitute with just about any green – cabbage, Chinese cabbage, lettuce, spinach – all are perfectly good substitutes. My brother makes his momos with wholewheat flour and adds some chopped daikon to the meat – which makes it hearty and delicious. Another amdowa friend, makes hers with shredded carrot and meat – strangely quite delicious in its own way. 1. Divide the dough into four parts. 2. Traditional method: Take one portion and make it into a long roll. Then pinch of small portions from one end. Shape each portion, rolling them in both your palms into a ball shape. Then flatten each ball and using a rolling pin, shape them into approximately 3″-31/2” round flat round circle. This is your momo skin. Take one portion of the dough, roll it out thin and flat as big as you can get. It shouldn’t be too thin but it shouldn’t be thick either. Then, using an approximately 3″ – 31/2” round cookie cutter (or suitable sized cup or glass turned upside down ), cut out the momo skins. 3. Take one piece of flattened dough, add a spoonful of your mixture and then shape your momos, starting from one end, close the skin together from side to side. The point is to try and not overlap the skin too much so that you don’t end up with a thick layer of folded dough on the top. This part takes some practice. Unfortunately, I don’t have the skills to post a video tutorial but there are some out there if you do an online search. 4. Oil your steamer tray, and line up the momos in the tray close enough but not touching. Add water to steamer bottom and once it boils, stack up the steamer trays on it. This step is important as over-steaming can simply ruin your momos – all the juices will disappear. Steaming momos is usually takes anywhere from 12 – 15 minutes depending on the size of your momos, strength of your stove burner and where you are – remember altitude counts – water boiling point is lower at sea level than at higher elevations so you need to increase cooking time. Take the lid of and touch one of the momos with your fingertips .. if its sticky, it still needs steaming – if its not, then it should be done. 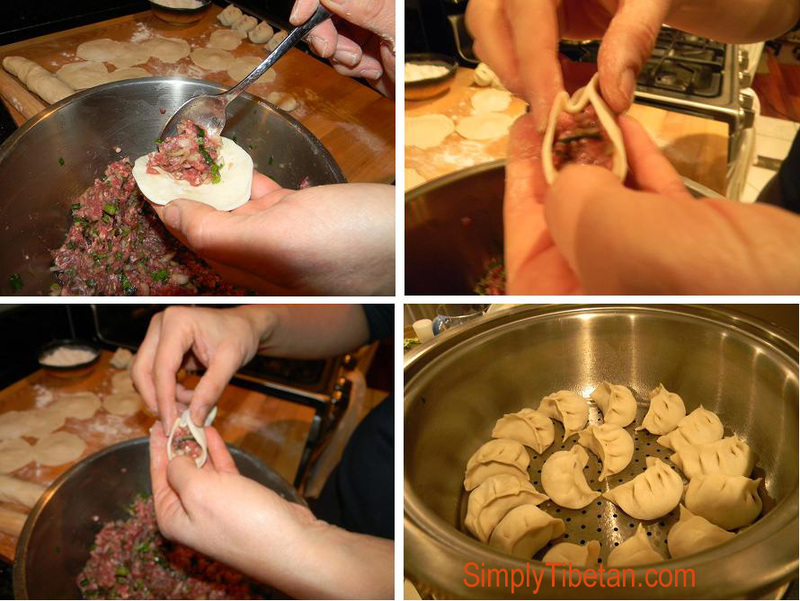 Third fool proof method – Just take one momo out, cut it open and check if its really done!!! Its fine to freeze uncooked extra momos. I always do this. 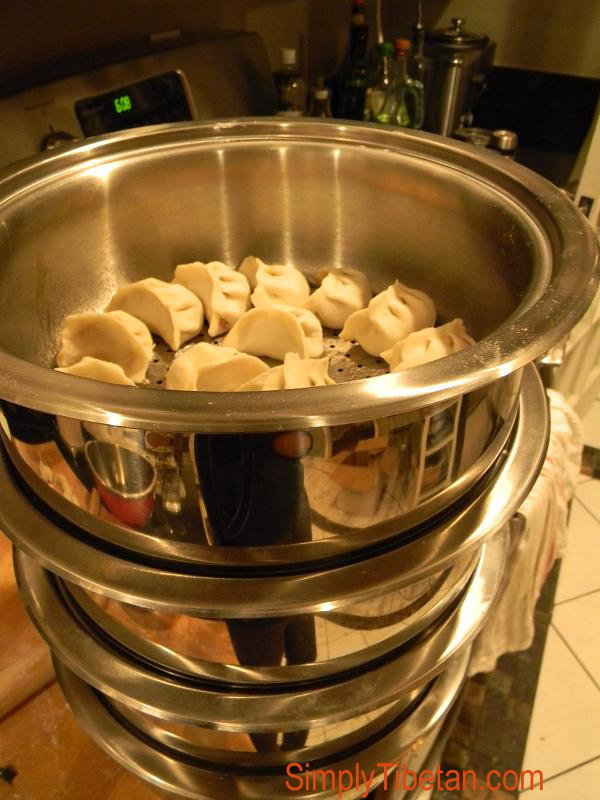 Just put the frozen momos straight into an oiled steamer and steam them directly. Takes a little longer to cook than regular momos but taste just as good. Potato and Spinach momo: Mash up some boiled potatoes, spinach, roasted onion, a dab of butter, salt and pepper to taste. Tofu, Shitake Mushroom & veggies: Chop up the veggies, add some roasted onion, cilantro, spring onion – dash of soya sauce, salt, pepper to taste. Is the minced (ground) beef cooked before you add to other ingredients? Or does it cook during the steaming process? Absolutely loved the video you shared for home style momos. 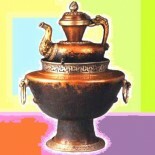 I was doing a bit of research on momo making – Nepali/Tibetan style and chanced upon your page. As Jeffery mentioned in his comment, I’d also add garam masala to the filling the next time I make chicken momos. Not to mention lots of fresh coriander. Thank you so much! I tried 4 different recipes before bumping into yours and it was an immediate success. It is very delicious. I like it MOMO!!!!!!!!!!! Thu-chay-nang for the compliment and the tag, Rigzin. I’m happy you learnt to make son labu. Michael, Thanks for the correction. Delicious! A lama friend taught me how to make them, and this recipe is very similar to his, but he didn’t use celery, but also used about 2.5 cm of ginger, minced. Also a bit of garam masala. As you say, there are so many variations, and these are absolutely addictive! I love to make momos and they are so, very delicious! The statement “…altitude counts – water boiling point is lower at sea level than at higher elevations so you need to increase cooking time” is completely backwards. The boiling point of water is higher at sea level than at higher elevations. See http://en.wikipedia.org/wiki/High-altitude_cooking if you are still confused. It’s difficult to say, as a lot depends on momo skin and the skill level. But portion size would be more than enough to feed four momo hungry people. Bon appetit! How many momos is this recipe for? 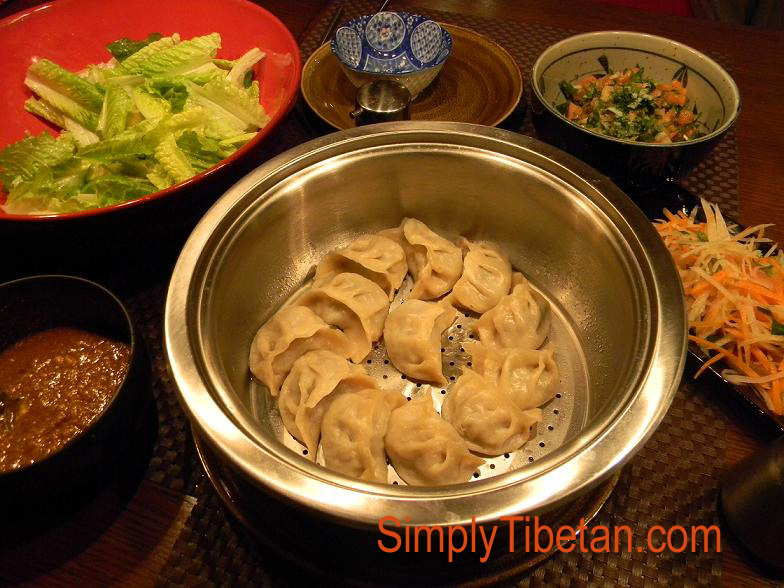 This entry was posted on February 24, 2013 by simplytibetan in Recipes and tagged momo, sha momo, tibet food, tibetan dumpling.